There's a part of me that can't even believe I've gotten this far so fast. I'm talking about the bed quilt I've been working on. You know - I joined The Big Bed Quilt-Along hosted by Rachel/Stitched in Color back in January. Having chosen Sidewalk Chalk, a pattern by Meghan/Then Came June, three weeks later I had a finished quilt top! Now just a couple of weeks later, Rachel/Stitched in Color and her husband Brandon have long-arm quilted it for me, and I love what I see! I knew early on that at 96" x 112" there was no way I was going to quilt this one myself. 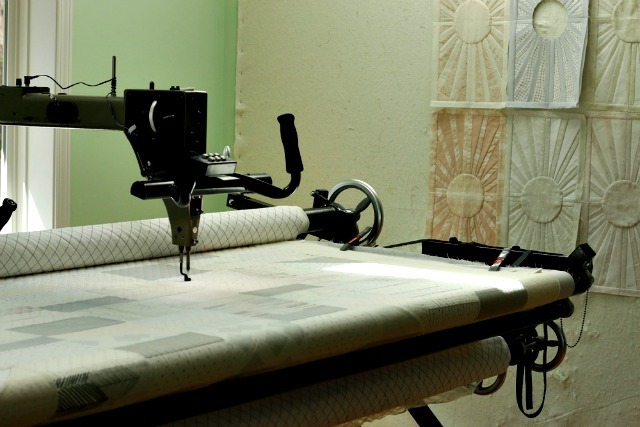 In addition to the treat of sending it off to Stitched in Color Longarm Quilting Services, it was nice to confer with Rachel about thread and quilt design choices, as well as quilting density. One of the options I was thankful to see when I placed my order was that of trimming the edges after quilting - yay! That was a no-brainer for me. Now when it gets home to me, I can get straight to binding. 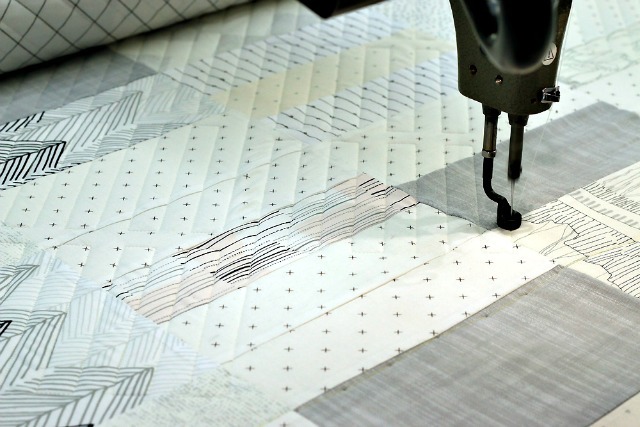 Rachel included my quilt in her in the Quilting Studio post yesterday, and she commented how the "Mirage" quilting design we chose gave the illusion of diagonal straight-line quilting. That just affirmed our choice to me as you know I love my straight-line. And being on the diagonal seems to complement the diagonals in the tree print and those Xs. Oh yeah. 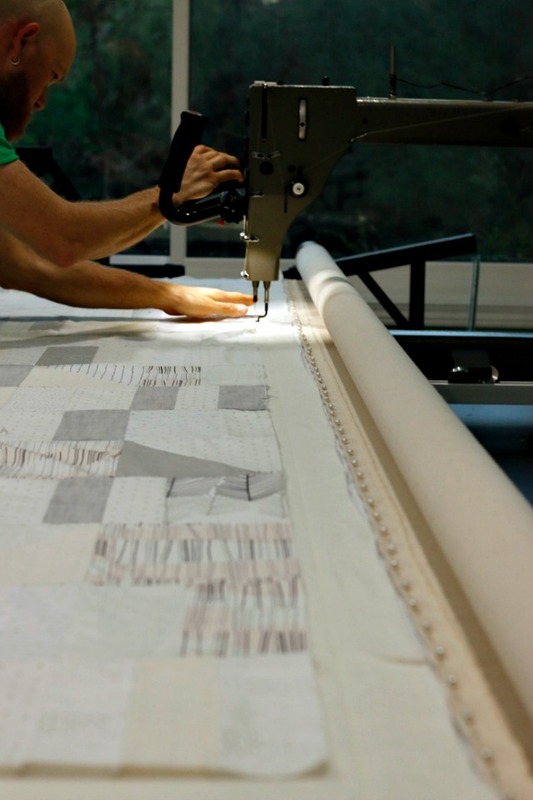 So I'm eager to see the quilt in person soon. Meanwhile I'll be rooting others in the #BigBedQAL along, as I know these larger quilts are no small feat! I loved the preview of this quilt yesterday. Wow, you've almost got this one to the finish line. I'm excited to see it. And that trimming service. Who loves that part?! It looks like an amazing quilt Debbie! Having it quilted by Rachel makes it even more special! It is neat seeing photos of them working on it!!! I started quilting/finish quilting my city sampler yesterday! This was a quick quilt even though it is huge! I'm dreading having to quilt one that is twin size! You went the right route having it long arm quilted. And I love the quiting you choose! Super! I'm excited for you and your quilt. Looks great! I can't wait to see the finished quilt.